These 2" x 3" crystal clear polypropylene bags offer transparent, resealable packaging that you can write on. Label and identify materials such as nuts, bolts, and sewing/craft supplies. These bags work great for organizing a high volume of supplies or for simple organizing. Bags come pre-opened and provide superior zip closure. 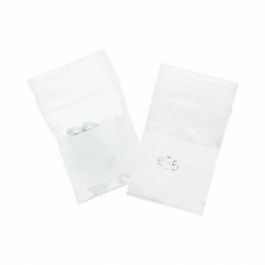 Our Crystal Clear White Block Zip Bags provide a great organizational method for identifying your products. 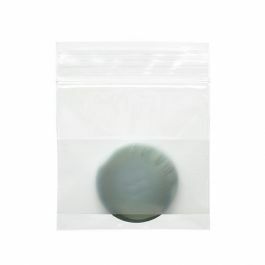 These 2" x 3" polypropylene bags make it really simple. They offer high clarity so it is easy to see the details of smaller, similar objects. The best thing is you can write on the bag. Who needs labels? The white block space makes it easy to organize large amounts of materials, ensuring that your written product information is always in the same place. Bags are zipped closed and are acid free, which work great for long-term storage.